Our team at West Covina Chrysler Dodge Jeep Ram studies our vehicles carefully so that we can give our West Covina consumers detailed information about the features that come with our models. The Ram 3500 is a top choice among heavy-duty pickup trucks because it offers many innovative features, which include exterior features that provide you with ample convenience and efficiency. 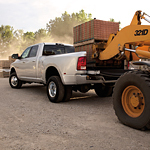 The Ram 3500 offers the available class-exclusive RamBox Cargo Management System. This includes a cargo box that is secure, lit, drainable, and durable. It also includes a number of features that include LED bed lighting, a cargo-view camera, a truck bed extender/divider, a ParkView Rear Back Up Camera, and the ParkSense Front and Rear Park Assist System. You can also choose the AllSecure Central Locking System that lets you lock and unlock the storage box with the push of a button. Wheel-to-wheel side steps are offered with the Ram 3500. These steps have a tubular shape that improves aerodynamics and boosts performance efficiency. They also make it easier to access the bed of the truck.